Tesla has already taken orders for its semi-truck, launched Nov. 16, from Wal-Mart, DHL, and Meijer, among others. 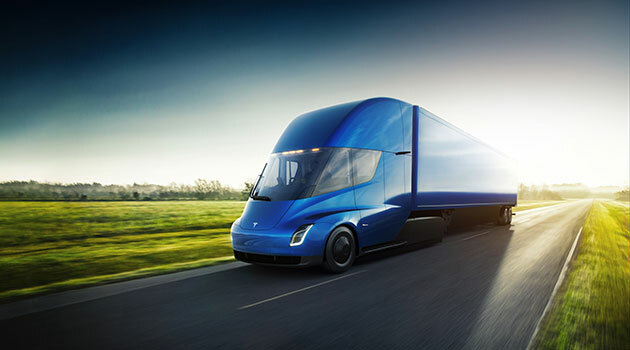 Elon Musk and company are expanding the Tesla fleet with a new semi-truck model that could lead truck drivers and hauling companies down a road less traveled. Companies have already begun to pre-order the Tesla Semi (due for production in 2019) since the electric carmaker unveiled their new creation on November 16. Anheuser-Busch, Walmart, and Meijer Inc. (a prominent Midwestern grocery chain) are three of the most notable names to have reserved a fleet of the electric rigs. Anheuser-Busch, which makes Budweiser and a number of other beer brands, pre-ordered 40 of the big rigs. Walmart pre-ordered five semis for the United States, and 10 for Canada, while Meijer reserved four. Additionally, transportation businesses such as DHL Supply Chain, Ryder, and J.B. Hunt have all placed small reservation orders. The first customers to pre-order the Tesla Semi paid $5,000, and since then, the reservation rate has risen to $20,000. “We have a long history of testing new technology—including alternative-fuel trucks—and we are excited to be among the first to pilot this new heavy-duty electric vehicle,” Walmart Spokesman Kory Lundberg said. The Tesla Semi truck boasts zero emissions, a 500-mile charge range, and the ability to reach 60 MPH in 20 seconds with an 80,000-lb. load. While Tesla’s big rig reveal roused customers, the company is still suffering from production difficulties with the Tesla Model 3. Tesla promised 20,000 Model 3 units by December 2017, however, the auto manufacturer has produced little more than 700 Model 3 vehicles to date. Furthermore, Tesla fired several hundred employees in late-October, though the lay-offs were not due to production issues, according to Tesla officials. Despite the past production problems and recent lay-offs, companies are still willing to buy in to the Tesla Semi.